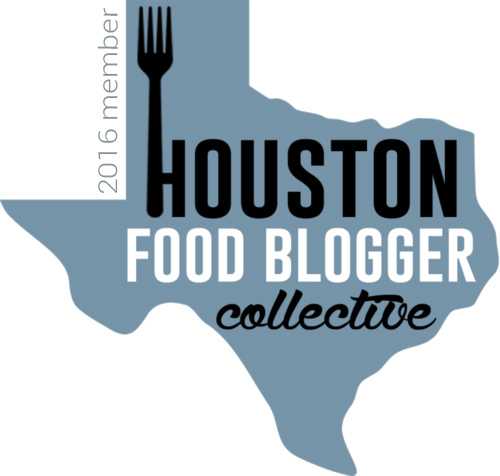 Houston Restaurant Weeks Brunch at Indika + A Giveaway! Only four more days until the weekend, which means only five more days until Sunday Brunch!!! Last Sunday, my friend Meredith drove into Houston from Humble and met up with me for brunch at Indika, located in Houston's Montrose neighborhood. One aspect of Houston Restaurant Weeks that I'd yet to take advantage of was brunch ($20 per person for three courses of food, um hello). 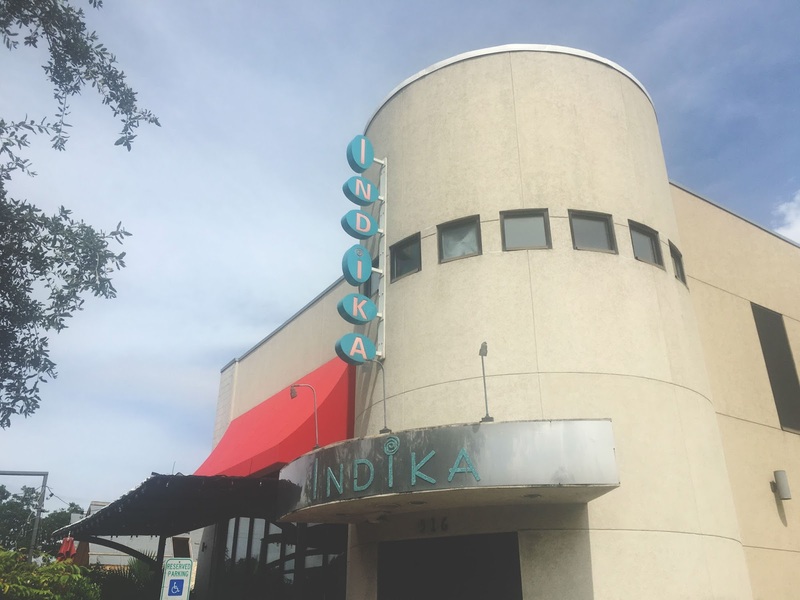 I've been eyeing Indika for quite a while, and their Houston Restaurant Weeks brunch menu looked ah-mazing, so it seemed like the perfect place to visit! 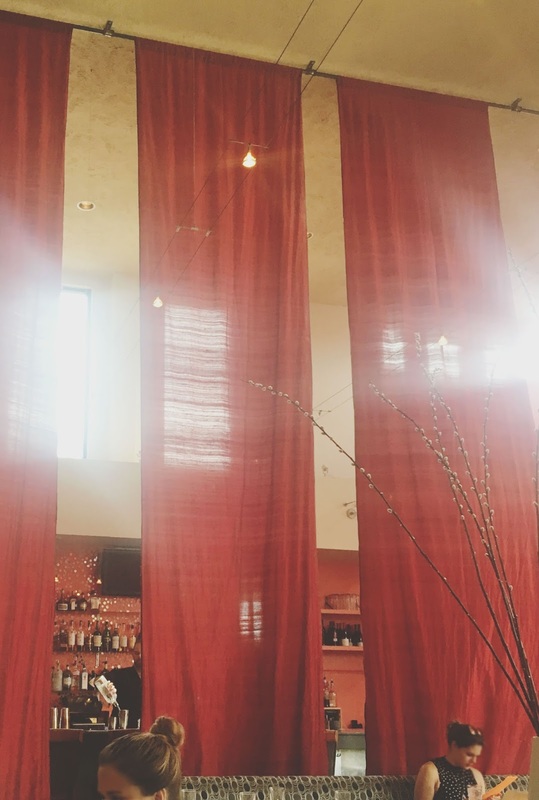 The inside of the restaurant is massive, with high ceilings and dramatic drapes. It's open, airy, and super inviting. We weren't drinking during this particular brunch because Meredith is pregnant with her cherub #2, and I prefer not to drink alone. <~~(I'm lying to you. I'd had a wild evening the night before, and by wild I mean played Monopoly and drank wine with Jon at home, so I needed a breather because this is what being an adult looks like). 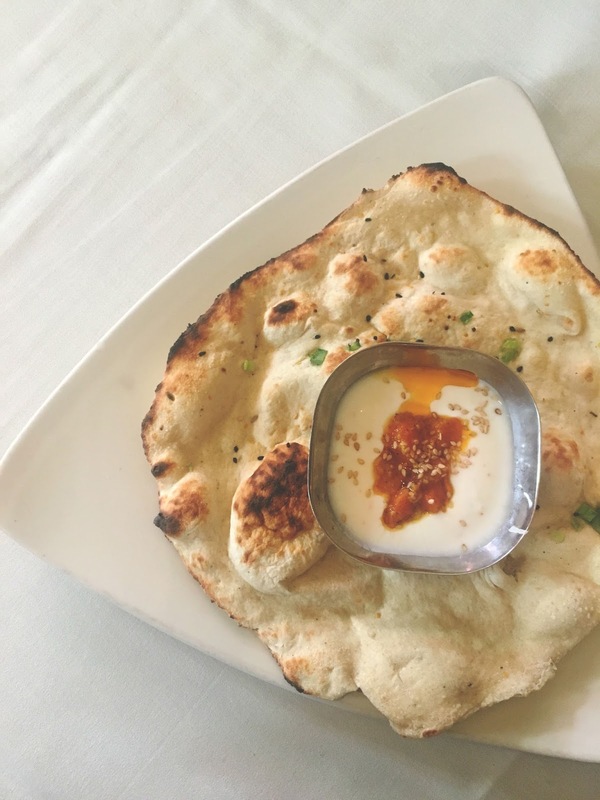 Before we ordered our food, we were presented with the restaurant's green onion naan with yogurt sauce. The bread was fluffy and gooey in that wonderful naan-like way, and the green onions in it created a unique and lovely flavor. Dipped in the tart yogurt, it was fantastic! 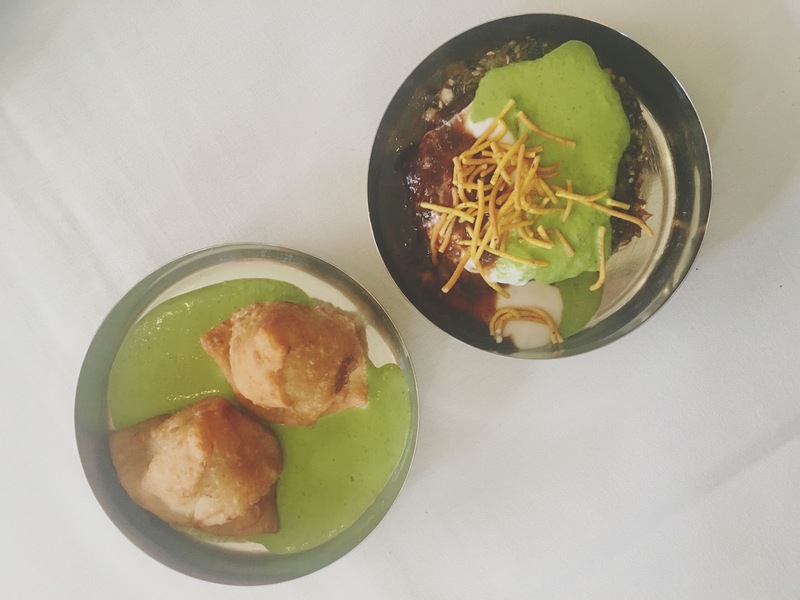 For our first course of food, Meredith ordered the restaurant's sweet potato samosas with cilantro chutney, and I went with the spinach cutlet chaat. Meredith's samosas were slightly crisped and doughy, and the outer casing did not overpower the fluffy sweet potato filling inside. The tart chutney offered a nice counter-balance to the softness of the samosa. And my spinach cutlet chaat was possibly my favorite food item of the whole meal. A spinach patty of sorts was topped off with the tart chutney, a sweet barbecue-esque sauce, a yogurt sauce (I think?) and crispy noodles. The patty was soft and super herby, and the combo of bright, contrasting, delicious flavors and textures on top was an absolute masterpiece. I couldn't get enough! For our second round of food, we got to pick two items (TWO ITEMS!!!). 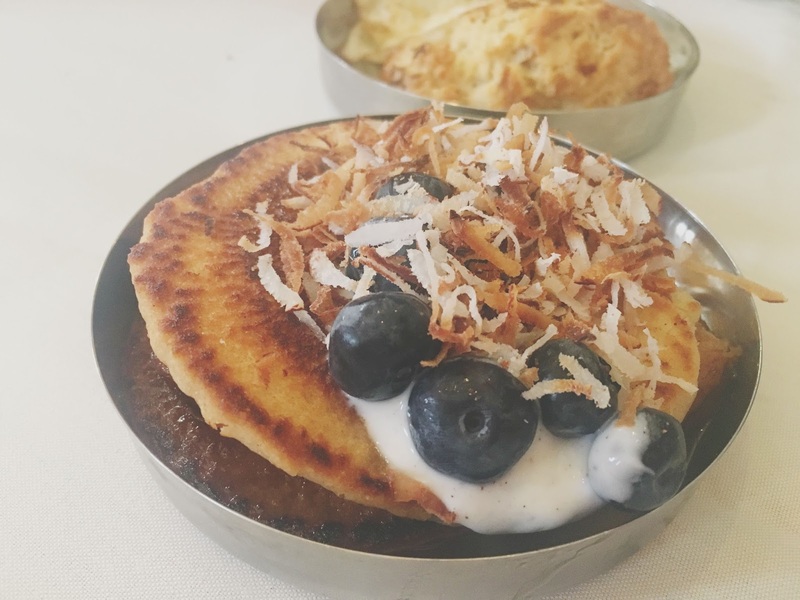 Meredith ordered the restaurant's coconut and millet pancakes with bananas, blueberries, and jaggery syrup, as well as the bacon cumin biscuit, pulled pork, and a fried egg (sans pulled pork). 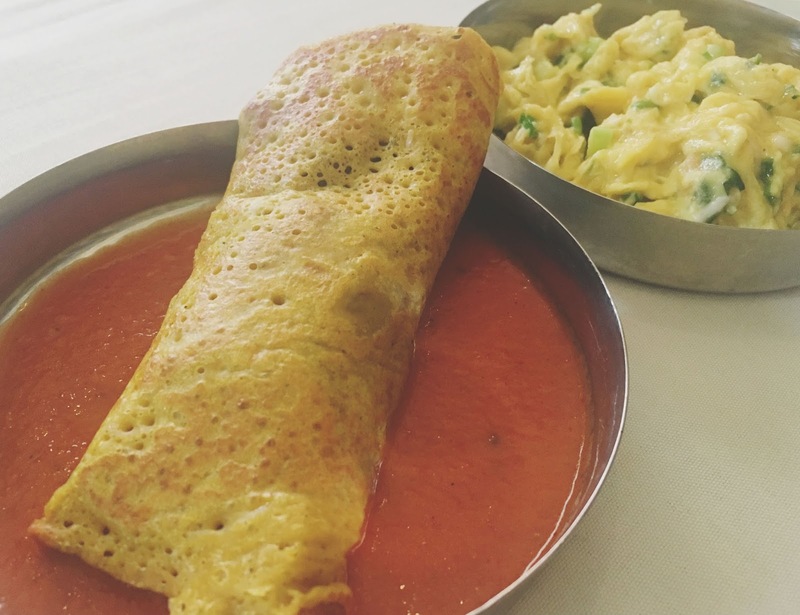 I opted for the chickpea crepe stuffed with mushroom and topped with tomato masala as my first choice, and the akuri (scrambled eggs) with a green onion masala. Meredith enjoyed her biscuit, but she was going NUTS over her pancakes! So of course I had to take a bite or three because they were UNREAL. The pancakes themselves were crispy/crunchy on the outside, and super dense and earthy on the inside. The bananas were essentially caramelized and downright sinful. The crispy topping of coconut flakes added wonderful texture, and it was all so delightful! It was definitely up there as one of the best bites we had! My chickpea stuffed crepe had a nice sponge-y texture, and it was filled with sauteed mushrooms. The tomato masala was bright and acidic and went well with the crepe. I enjoyed this dish, though I think I enjoyed my eggs more. The taste of the akuri was wonderfully chive-y, and the texture was SUPER creamy. I'm definitely going to try to master the art of Indika's scrambled eggs at home! For our final round of food (dessert! 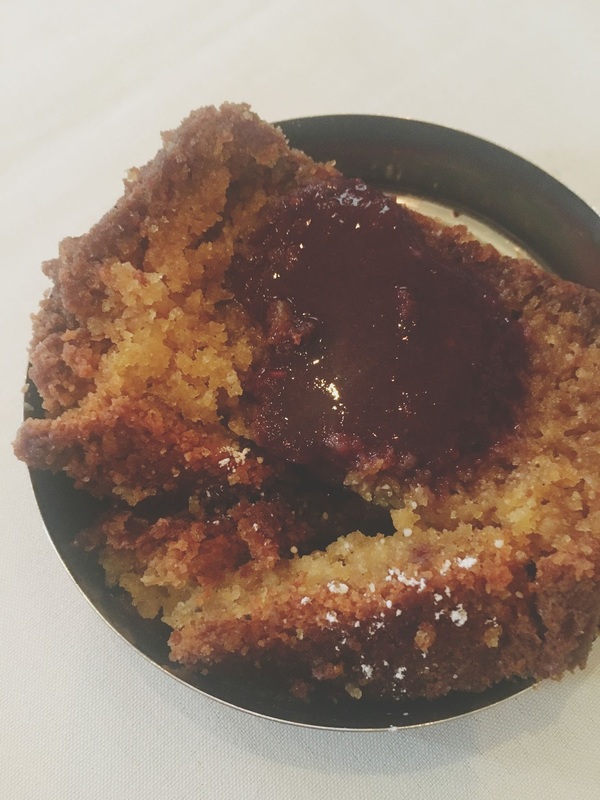 ), Meredith ordered the rose cake parfait, and I opted for the restaurant's olive oil black pepper cake with blackberry compote. Unfortunately, neither of us got really jazzed about the parfait (pictured above). To me, it was way too sweet and almost had a perfume-y taste. Meredith claimed it made her molars sing. BUT THAT OLIVE OIL BLACK PEPPER CAKE (pictured below), OMG. That cake was outstanding! The outer bits of the cake were crumbly and crunchy, resembling that of a coffee cake or cobbler. The flavors of it sang of harvest and Christmas time, with hints of cinnamon, cardamom, and cloves. The earthy, soul-warming cake was made brighter with the use of the sweet, tart blackberry compote, and the end result was just fabulous. This cake was neck and neck with the chaat for being my favorite dish! 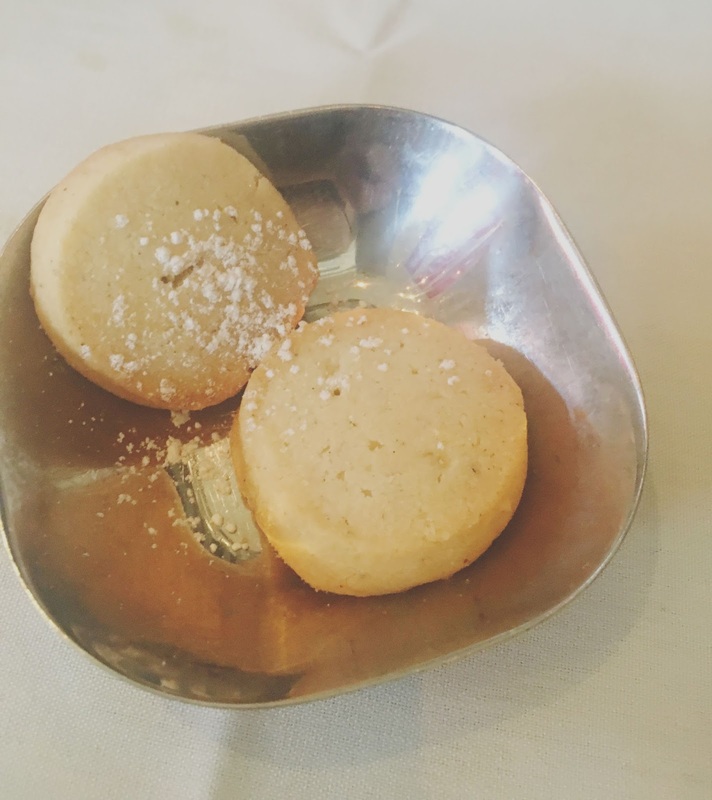 And as if that wasn't enough, when we were finished, we were presented with two cardamom butter cookies. While having the texture of English tea cookies and the buttery-ness of shortbread cookies, they were on a whole other level with the warm, festive spice of cardamom thrown in. We loved them! Houston's Indika offers high quality Indian food in a beautiful, inviting setting. 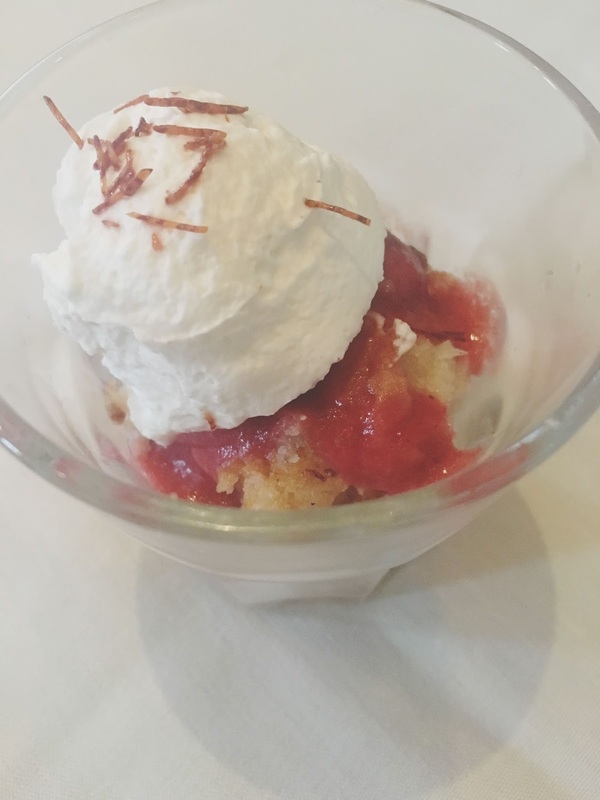 The Houston Restaurant Weeks menu is a wonderful way to explore their different food offerings, and I cannot recommend Indika's Sunday Brunch enough! OH AND SPEAKING OF BRUNCH. One lucky Adventures in a New(ish) City reader will receive two (2) VIP tickets to the Inaugural Houston Press Morning After Brunch Event, held at Bayou City Event Center Pavilion on Saturday, October 1, 2016 from 11:30 am - 2:30 pm. These VIP tickets, valued at $55 – $75 each, grant you early entry 30 minutes prior to the event (11:00 am), as well as food, wine, beer, and cocktail sampling. To enter the giveaway, all you have to do is follow me on Instagram (if you don't already), and leave a comment on this photo, telling me what your favorite brunch item is! A winner will be randomly selected by the end of this week, Houston residents only please. Good luck! Most important meal of your day/week/life.